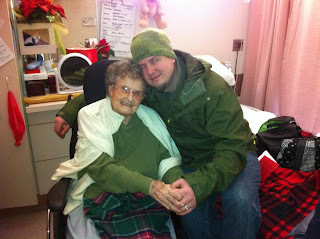 Last Sunday my mom and I went and visited my grandma who is in a full care facility in Burnaby (my dad's mom). It was a beautiful day for a drive and since the pregnancy has really hit me hard, I haven't been able to visit her nearly as much as I would like. I am always anxious driving up to her place because I am never quite sure what I am going to find when I enter the doors. She might be having lunch with the other residents or she might be sleeping in her room. She might have an injury of some sort or not be feeling well or she might be feeling good that day. No matter what we find when we see her, she always looks amazing and put together. I really hope I have my dad's side of the family genes - almost no wrinkles and gorgeous skin. On Sunday we found her with her table mates waiting for lunch. Her hair was curled and she was in a kimono type gown so she was cool in this summer heat. A lovely lady named Linda comes in to help her with her meals. 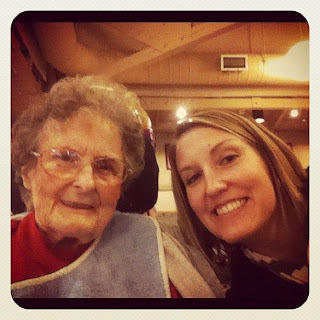 We caught up with Linda while she fed my grandma her lunch - and grandma insisted on holding my hand the entire time :) She has had a couple of strokes so her speech isn't quite the same as it once was and she gets confused. 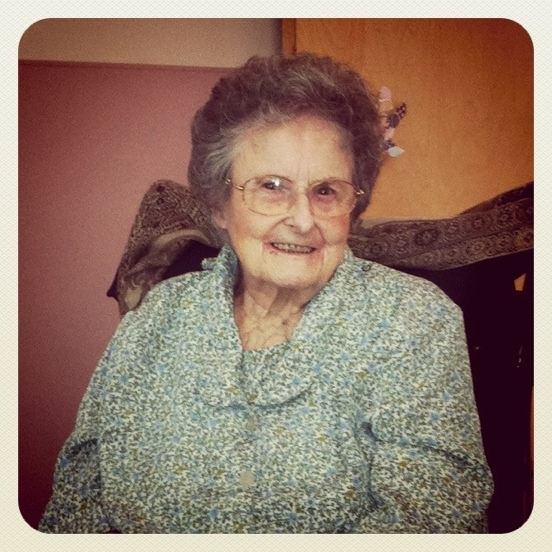 The woman is 90 though so she has lived an amazing, good, strong and supportive life. After lunch she was still holding my hand and stared right into my eyes and said, "I have absolutely no clue who you are." It hit me hard - like I ran into a brick wall. I knew this day would come but I wasn't fully prepared for the emotional roller coaster it was going to take my on. Memories flooded my brain - chicken noodle soup, knitting, playing cooking school while we made my grandfather's lunch, swing sets, cupcakes, homemade Christmas wrapping paper ... the list just kept scrolling like I was being forced to remember every good moment with my grandmother. Grandma Bower is a wonderful lady who has always been full of love and light and amazing strength. I'm glad you have her still, and I'm glad I've known her. Sending mega ninja-sized hugs to you. My grandma had alziehmers hit at 88, so I can understand your feelings. what is with the lip service ladies?